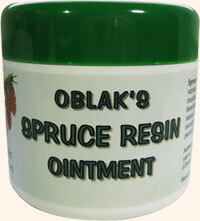 Spruce resin products are well known and widely used in traditional folk medicine all over the globe for various skin problems such as injuries (wounds) and inflammations. 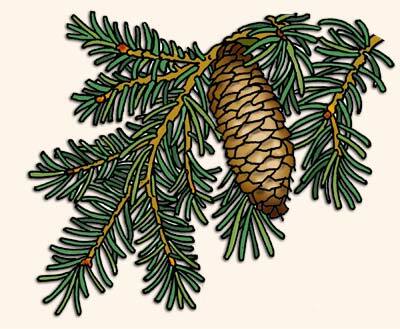 Spruce resin as active ingredient stimulates blood circulation and lymph system. This has beneficial effect since it supports the capacity for skin regeneration, improves the natural defenses of the skin and stimulates the skin functions. It is highly recommended to use ointment or body oil as massage base for reviving care and regeneration of stiff back, painful joints, shoulders, muscles and tired limbs. It has been also scientifically proven that spruce resin has antimicrobial properties which additionally promotes faster recovery. Main active ingredients are spruce resin, marigold (calendula) and common yarrow extracts, vitamin E and natural alpha-bisabolol (anti inflammatory). Ointment base is made of 100% natural vegetable Vaseline (olus oil) which is a mixture of triglycerides from vegetable origin produced according to a unique patented formulation and is a vegetable substitute to petrolatum. Ointment base includes also organic oils from jojoba, olive, sunflower and almond, beeswax, lanolin and shea butter. Both ointment and body oil are without artificial aromas, colors, alcohol, preservatives and mineral oils (parafin). Jože Oblak, MSc (1893-1963) who was a well known pharmacist from Ljubljana, Slovenia started with production of spruce resin ointment. In 1923 he finished a Master's degree in Pharmacy at the University in Zagreb. 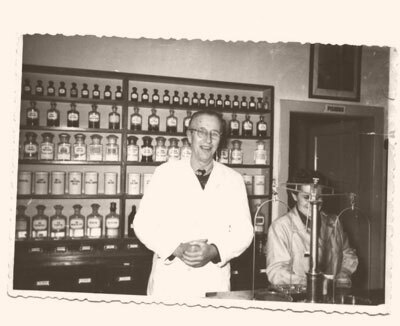 Most of his life he worked in a pharmacy in Ljubljana-Šentvid. He also made a lot of other known natural and herbal remedies. Today his products are being produced, under the original directives, by his son Jožef Oblak, jr, MSc. who is also a member of the Herbalists Association of Ljubljana, Slovenia.